Welcome to the AmericInn Lodge and Suites of Hutchinson. 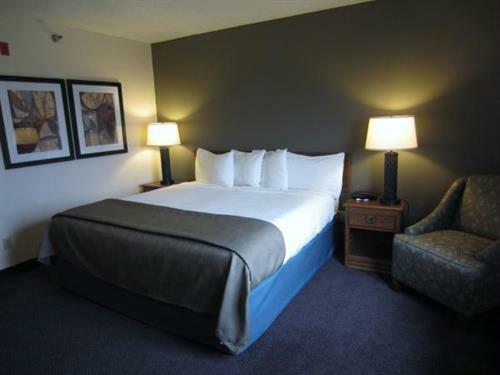 AmericInn Lodge and Suites of Hutchinson, Minnesota offers spacious accommodations ideal for leisure vacations, family getaways and business travel in Minnesota. AmericInn Perk is a friendly coffee shop where we serve our complimentary breakfast. It offers a choice of delightful pastries, cereals, fresh fruit, hot waffles and more. The aroma of fresh brewed coffee greets you as you're checking emails, reading the morning newspaper, or having a business meeting. Each morning, only a few steps away from your pillow, we make the most important meal of the day a memorable one. With our special location with two buildings only minutes from most activities we are the ideal place for your team to stay. Featuring the area's nicest indoor pools with whirlpool and sauna, our complimentary AmericInn Perk breakfast with make your own belgian waffles, and complimentary high speed Internet, the AmericInn can't be beat. At the AmericInn of Hutchinson, special wedding room rates are available for all of your out of town guests or in town family and friends that will be attending your wedding. Signature honeymoon suites with whirlpools are also available for your special night. With our great rates and location, the area's nicest pool, our complimentary AmericInn Perk breakfast each morning, and numerous shopping locations and restaurants within minutes, the AmericInn is ''The Perfect Place for the Perfect Wedding''. Please call us for further information and to make your reservations now! Conveniently located on Hwy 7 East just 45 minutes from Minneapolis.